Josh Basha is a complete coach that understands the importance of goal setting. Players training with Josh can enjoy technical and tactical based drills, periodization planning, tournament schedule planning, injury prevention training and/or physical fitness training. 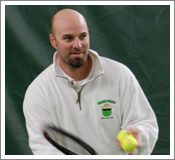 He has experience coaching competitive player development, USTA 10 & under training, cardio tennis, adult team practices, wheelchair tennis, and specialty seminar workshops.